Bees in Missouri can be problematic, especially during the summertime. Honey bees, bumble bees and carpenter bees are the most common types of bees people encounter around their homes. Although bees mean no harm to humans, they can sometimes become a threat to our homes and families. When you have a bee infestation on your hands, it is important to call a professional bee pest control service. Bees can become very aggressive when they feel threatened; which is why it is never a good idea to take on a bee infestation on your own. Bug Out Pest Control provides an excellent bee exterminator service that will ensure efficient bee removal from your home. In recent years, statistics show there has been a significant decline in the bee population. 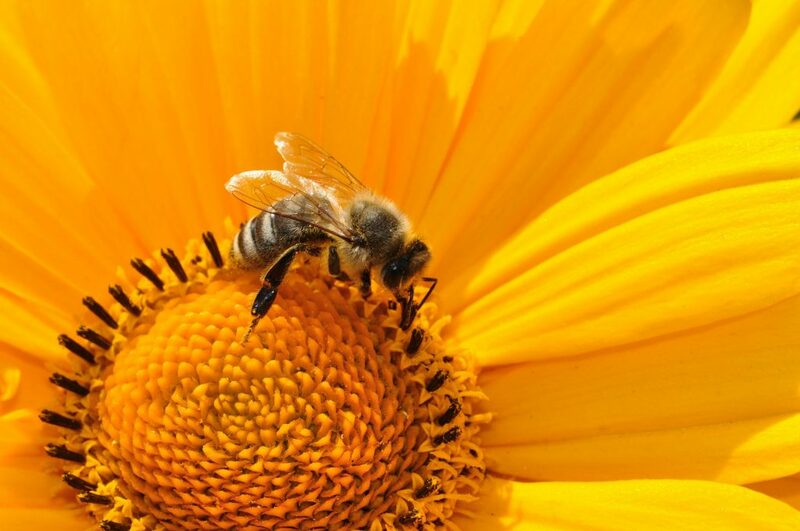 Bees pollinate over half of the crop species humans and animals use as food sources. Without bees and their pollination capabilities, our ability to survive would diminish greatly. When at all possible, it is extremely important to remove bees safely from homes and prevent harm to these crucial creatures of our ecosystem. During warmer months such as spring, summer and fall, you will start to see bees emerge outside. It is important you understand the difference between a problematic bee issue as opposed to a non-threatening bee issue. If you notice there is an unwanted beehive in your backyard that is noninvasive, this can be taken care of by a beekeeper. However, sometimes bees will nest in wall cavities, roofs, chimneys and wood panels of your home. This can cause serious destruction to your home and calls for a professional bee exterminator. There are many reasons people ask bee control services to come to their homes. Perhaps someone in your family is highly allergic to bee stings, or the bees are generally bothersome to you and your loved ones. When you spot a beehive around your house in plain sight, this is a job for a beekeeper. Beekeepers will come to your home and safely remove the bee colony along with their hive. If you are unsure whether your bee issue is right for a beekeeper or bee exterminator, Bug Out will come to your home and assess the situation. Bug Out understands bees are extremely important to our ecosystem and will try to safely remove bees before performing the alternative. Beekeepers will relocate bees and their beehive somewhere safe and out of your way where they can continue pollinating. When beekeepers are unable to reach the hive and bees have physically invaded a part of your home, it is time to call a bee exterminator. With our bee removal service, you can rest assured we will try our best to remove the bees as safely as we can. Unfortunately, sometimes this is impossible to do when faced with an extremely threatening bee infestation. If the bees are swarmed inside your walls or burrowed in wooden panels of your home, this causes a major threat to you and your family. Bug Out cares about your safety and will take any necessary precautions to provide effective bee removal from your home. Bee stings can cause mild to severe allergic reactions. If you or a family member are severely allergic to bees, one sting can be deathly. While fatal reactions are rare, those who are severely allergic to bee stings may require special medical attention. Multiple stings can also increase the severity of reactions even for those who aren’t allergic to stings. Carpenter bees are known to damage wood; including windowsills, doors, decks, fences, railings and other areas of the home. Swarms of bees will begin drilling in your wood where they will create a home for themselves. The sooner you utilize carpenter bee control, the better. Once the bees have found a home for themselves, they will feel threatened and become aggressive when trying to be relocated. Do you need professional bee removal assistance? Bug Out proudly provides our bee exterminator services to Columbia, MO and other surrounding mid-Missouri areas. Contact us today for more information. We will do everything we can to remove unwanted bees from your home, quality guaranteed!